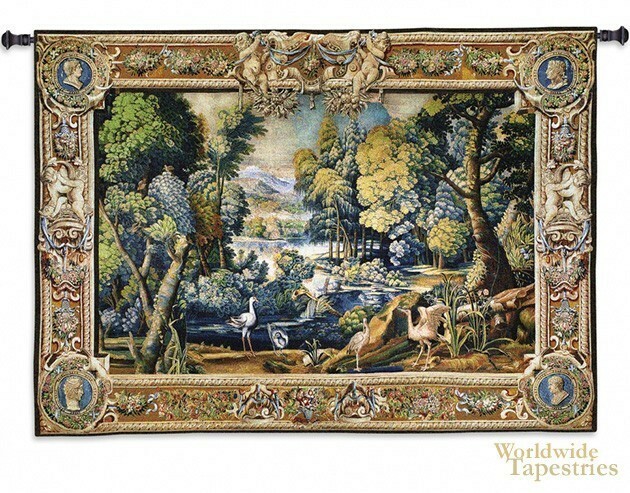 The forest has often been an inspiration for tapestry makers for centuries, In this tapestry we see a prime example of this. The foreground of birds and fowl is surrounded by a foreground, midground and background of trees and foliage in a variety of colors to the lake beyond. The use of greens is accompanied by the yellows of some of the trees and the natural browns of the earth and tree trunks. However there is also the use of the blue green, which provides a gorgeous touch to this piece as it ties the themes of the trees and foliage to lead the eye to follow the direction of the lake to the mountain ranges and sky beyond. This tapestry is backed with a lining and a tunnel for ease of hanging. Note: tapestry rod and tassels, where pictured, are purchased separately.